Annie Edson Taylor (October 24, 1838 – April 29, 1921) was an American school-teacher and adventurer. 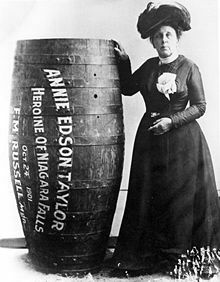 She was the first person to go over Niagara Falls in a barrel without dying. She did this on her 63rd birthday, October 24, 1901. ↑ "Daredevils of Niagara Falls". niagarafallslive.com. Retrieved 2011-04-30. Women of Bay County, Joan Totten Musinski Rezmer (ed.). Bay County Historical Society: Bay City, Michigan, 1980. Queen of the Falls, Chris Van Allsburg. Houghton Mifflin Books for Children. This page was last changed on 11 March 2018, at 20:33.